Tag line: "It's a real monster mash when they clash!" Trivia: Much of the electrical lab equipment in Duryea's lab are props originally used in 1931's Frankenstein. 1971's Dracula Vs. Frankenstein was Lon Chaney Jr's last film, which, to be honest, is rather unfortunate. In a career that saw him portray such iconic creatures as the Wolf Man, the Mummy and even Frankenstein's monster, to see him reduced to playing an idiotic sidekick in this sort of low-budget shlock is just too depressing for words. When her sister disappears from a seaside amusement pier, singer Judith Fontaine (Refina Carrol) begins a frantic search to find her, seeking help from both the police and her sister's friend, Mike (Anthony Eisley). What they don't know is the poor girl has already been murdered, the latest victim of the deranged Dr. Durea (J. Carrol Naish). With the help of his mute assistant, Groton (Chaney), Dr. Durea - the last known descendant of the Frankenstein family - has been collecting beautiful young women to use as test subjects for his fiendish re-animation experiments. But that's not all; Dr. Durea has also received a visit from Count Dracula himself (Zandor Vorkov), who is seeking a serum that will allow him to live forever, and what's more, he's brought the remains of the original Frankenstein monster (John Bloom) with him! Dracula Vs. Frankenstein suffers from a number of problems. For one, the mad scientist of the piece, Dr. Durea, spouts off some of the most unintentionally hilarious dialogue I've heard in a while. Try as he might, there was nothing veteran actor J. Carrol Naish could do with lines like “The greatest mysteries in the world are not mysteries at all, unless we take time to become familiar with them”. But then, at least Naish was given something to say; Chaney's Groton is a mute, save the occasional grunt (which he usually saves for those moments when Dr. Durea sends him out to fetch a fresh victim). As for Count Dracula, his voice emits a strange echo whenever he speaks (an effect that annoyed me by the time he uttered his third word); and with his melted skin and flattened facial features, Frankenstein's monster looks more disgusting than sinister. Even the monster's kills are uninspired (the scene where he squeezes the life out of a surgeon, played by Forrest Ackerman, was bland at best). Rounding out this cast of misfits is Grazbo (Angelo Rossitto), the 2 ft. 11 inch tall carnival barker who eats dollar bills, yet another head-scratcher in a film that, before its over, will have you scraping yourself bald. 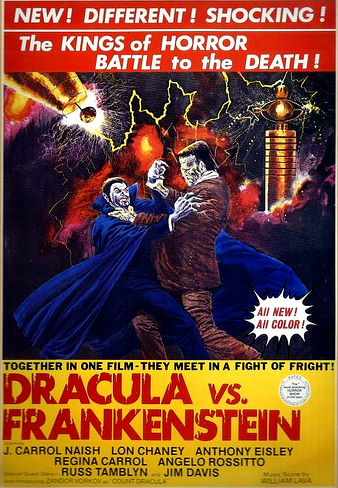 If you get a kick out of goofing on cheesy, low-budget fare, then Dracula Vs. Frankenstein will provide enough side-splitting material to last you a week. But if you're in the mood for a straight-up monster flick, you'd be better off passing this one by.